Official fall 2016 enrollment numbers at Minot State University show a 2 percent increase compared to official numbers last year. The number reported to the North Dakota University System is 3,412 students, an increase of 64 students. This is the first increase the university has experienced in six years and the largest overall enrollment since 2013. The total number of new students, including freshmen, transfers and new graduate students is currently 801, up 11 percent over last year’s official fourth week figures and the second highest in six years. Included in these new student numbers is the largest number of new transfer students in a decade. Additionally, the number of new freshmen increased for the second straight year, and after a five-year decline, the number of students from Ward County increased by 4 percent. Final figures also show a 16 percent increase in the number of MSU students taking classes at the Minot Air Force Base. As Sept. 20 represented the fourth full week of classes, enrollment numbers at Minot State are now official and reported to NDUS. The Minot Area Council for International Visitors developed local programming for Eric Erfors, Stockholm-based editorial writer for Expressen, one of Sweden’s largest newspapers, as he visits the Minot region Sept. 26-29. Erfors is interested in United States elections, focusing on the state and local levels. He will also discuss media careers with Minot State University students. As part MACIV’s local program, Erfors met with North Dakota Secretary of State Al Jaeger, explored the use of social media in a state senate campaign and learned about initiated measures, focusing on the proposed tobacco tax and the Minot City Council transition. On Wednesday (Sept. 28), he will also discuss careers in journalism with MSU communication arts students. This discussion, which is free and open to the public, will be in Aleshire Theater at 3 p.m. For more information, read the full news release. Minot State University and the University of Lodz, Poland, entered a cooperation between MSU’s Master of Science in management degree program and UL’s MBA program delivered by its Polish-American Management Center. The two universities signed a Memorandum of Understanding Sept. 23, forming the basis for the partnership. 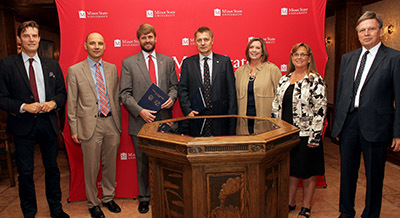 Pictured, left to right, are Robert Kozielski, UL associate professor and Polish-American Management Center executive director; Jacek Mrozik, MSU College of Business dean; Steven Shirley, MSU president; Grzegorz Urbanek, UL vice president of economic affairs; Linda Cresap, MSU professor; Lori Willoughby, MSU professor and Graduate School assistant dean; and Jerzy Gajdka, UL associate professor and MBA program director. The University of Lodz, Poland’s third largest university, has an enrollment of 38,000 students. For questions, contact Mrozik at jacek.mrozik@minotstateu.edu or 858-3110. Author Merie Kirby, Grand Forks, will present “Confronting Trouble: Finding Solace,” readings from her recent works, Monday (Oct. 3) in Aleshire Theater at 7 p.m. This presentation by the 2016 recipient of the North Dakota Council on the Arts Individual Artist Fellowship in Literature is part of the Northwest Art Center lecture series. The evening begins with Joseph Haydn’s last symphony, Symphony No. 104, “London Symphony.” Colombian virtuoso clarinetist Benito Meza will be featured in Maestro Amaya’s clarinet concerto "Wuaraira Repano," the aboriginal name given to the mountain that towers over his birth city of Caracas, Venezuela. Finally, the audience will experience Ralph Vaughan Williams’ “A London Symphony,” one of the most famous symphonies by a British composer. Minot State University students, faculty and staff are admitted free with a current ID. Ticket prices for adults are $25 main floor and $30 balcony; senior citizen is $20 main floor and $25 balcony; students 13-17, $15; children 12 and under, $10. Eric Anderson, principal cellist, invites symphony attendees to a 6:30 p.m. preconcert lecture for an inside look at the symphony program. For more information and to purchase tickets, visit www.MinotStateU.edu/symphony/. The Northern Lights International Film Series continues Oct. 10 with the 1985 Swedish dramatic film, "My Life as a Dog." The film begins at 6:30 p.m. with a social preceding the film at 6 p.m. The film follows the life of a 12-year-old boy sent to live in a country village when his mother falls ill. Warmhearted eccentrics give him a refuge from misfortune. The screening is free and open to the public. There will be a door prize drawing for a gift card to a local restaurant supporter of the film series. For questions, contact Scott Sigel, assistant professor of foreign language, at scott.sigel@minotstateu.edu. Dining etiquette is something often taken for granted, but if individuals are interviewing for jobs, networking or conducting business over a meal, they cannot. Minot State University offers an Etiquette Luncheon to expose students, faculty and staff to the basic principles of traditional etiquette used during a business meal through hands-on interaction. This year, the Oct. 11 luncheon begins promptly at 12:30 p.m. in the Conference Center (Student Center, third floor). The cost for students is $5 (or use meal plan) and for faculty and staff is $15. Professional dress is required. Please register by Oct. 4. Individuals can register for the event at the Office of the Vice President for Student Affairs (Administration 164), College of Business (Old Main 304), Division of Humanities (Hartnett 148W), Department of Teacher Education and Human Performance (Swain 218) and Dakota College at Bottineau (Administration 159). For questions, contact Lynda Bertsch, director of career services, at 858-3996 or Lynda.bertsch@minotstateu.edu. Western Plains Opera is excited to announce open auditions for all roles in its January production of “Fiddler on the Roof.” Auditions will be Oct. 22 in Ann Nicole Nelson Hall, 10 a.m.-4 p.m. Individuals should be prepared to sing one song (Broadway show tune preferred) that displays their voice and acting well. A pianist will be provided. (Individuals should bring along sheet music for the pianist.) Individuals should also prepare a monologue or do a cold reading for the audition. Regular rehearsals for the production will begin Jan. 2 and run through the performances, with some music/choreography rehearsals on weekends in November and December. Performances will be Jan. 26-29. For more information, visit the audition announcement and character descriptions. Please sign up for an audition time in advance and please fill in all requested information. For questions, contact Mark McQuade, WPO general director, at 858-3189 or mark.mcquade@minotstateu.edu. Minot State University welcomes new employees, Sara Frantsvog and Melanie Sundquist. Frantsvog, nursing instructor, previously worked at Trinity Health’s Cancer Care Center. She received a Bachelor of Science in Nursing from MSU in 1998 and a master’s degree in nursing education from the University of Phoenix in 2016. Her husband is Dean Frantsvog, associate professor of accounting and finance. They have two children. Sundquist, athletic facilities worker, attended Minot’s Headquarters Academy of Hair Design. She and her husband, Shane, have seven children. Keyona Walker, their daughter, is the 2016 Homecoming queen. Sept. 28-30 — Americas 2016: All Media features traditional and experimental works of any medium and juried by Kim Fink, UND, professor of art and printmaking, Hartnett Gallery. Sept. 29-Oct. 28 — “Regando el Maíz y el Nopal (Watering the Corn and the Cactus),” etchings by artist Marco Hernandez, best-of-show winner from Americas 2015: All Media juried competition, Library Gallery. Oct. 11-Nov. 10 — “Nuances,” collaged monotypes by North Dakota native Michelle Lindblom, Hartnett Gallery. Holly Pedersen, Department of Special Education chair, presented her research titled “What’s So Special About Dads? : Supporting Fathers of Deaf & Hard of Hearing Children in Early Intervention” at the International Hearing Education Across the Lifespan conference in Lake Como, Italy, in June. Braden Mayes, school psychology graduate student, received acceptance to present his thesis “Enhancing Relationships: An Investigation of Foster Parent-Child Characteristics” at the National Association of School Psychologists annual conference in San Antonio, Texas, Feb. 21-24. His research examines whether differences exist in parenting practices between traditional and foster care parents.